I spotted Hendrikje Horsten over at Iqons. She studied at Utrecht School of Arts where she attended The Master Programme of Fashion Design. Her work is an amazing work on fabrics that gives birth to a spectacular collection! Hendrikje Horsten,infact,loves experimenting with fabrics. Her collection becomes stronger by the use of textile techniques. About this collection Hendrikje says: "I chose the technique patchwork to make my concept stronger. The clothes become valuable by the use of patchwork, you can see all the amount of work in it. The dress in blue/brown/white is made of 1800 pieces of fabric" . 1800 pieces of fabric: what a work! 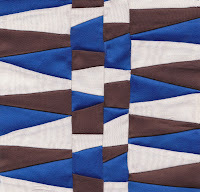 Besides, I love the combo color of patchwork fabric: grey/brown; blue/white/brown; brown/grey! The Hendrikje's collection is about Slow Fashion. For me, this is an important concept. The designer says "... I want to give a reaction on fast fashion and the speed of change. Trends move more quickly then ever before, and nowadays its only about‘la nouveauté pour la nouveauté. I'm giving expression to former values: attention, handicrafts, durability and time". The Hendrikje's collection is simple in the shapes, very wearable, but with a huge handicraft work inside, that is the value that gives the beauty to the collection! I really agree with this concept to slow fashion and to give more durability to it. What do you think about it? Let me know , please!!! Ho visto il lavoro di Hendrikje Horsten su Iqons (è tra i miei friends su Iqons). La sua collezione è semplice nelle forme, molto portabile, ma i tessuti con cui è realizzata sono formati da bellissimi patchwork. Il vestito in blu/marrone/bianco è fatto con 1800 pezzi di tessuto: che lavoro! Slow fashion è il concetto da cui prende forma questa collezione. La moda, infatti, sembra proprio aver bisogno di un rallentamento, poichè è diventata, soprattutto negli ultimi anni, sempre più veloce e sembra cercare a tutti i costi la la nouveauté pour la nouveauté. Hendrikje Horsten , con il suo lavoro di artigianato, cerca di dare più durabilità ai suoi capi ... e penso che ci riesca benissimo! oh wow, loving all that pattern! beautiful!